Today is Carol Mayne's birthday! Our happy-dancin' friend Bev is hosting a little birthday party for Carol today. Since Carol is experiencing wintry weather in her part of Canada, Bev suggested that we go with a tropical theme for our cards. I tried to create a beachy feeling by using the colours of sand, water, sky and sun. And one, single, solitary Simon Says Stamp sentiment stamp. Happy Birthday, Carol - I hope you have a wonderful day and enjoy all the warm cards and wishes coming your way! This is wonderful, such fun & fresh colors! Love it!!!! So gorgeous the SUNNY yellow!!! Wonderful birthday card for Carol! Fabulous card!! I love your design and the colors!!! Now THIS is CAS perfection!! LOVE the colours and of course the design! No wonder Carol is over the moon with your special treat for her!! Love the spot light sentiment! Awesome card! Brilliant design--"classic Ardyth"--love it & I know Carol does, too! What a fabulous and happy card, and your stamping is just perfect. Very cool effect with the yellow and green. I'm trying to figure out how you got everything lined up so well. Wow, this is lovely. I love the design and those colours are perfect! That Circle was doing funny things with my eyes - It really looks 3D on my screen! Wish I knew what made the difference! Maybe the light angle? Anyway - it is such a fun card! I like it very much! Yes, classic Ardyth! 'Brilliant' (as in sun) and 'warm' (as in tropical waters) and relaxing (as in beach chair on a sandy beach). Makes me want to whip up a nice Chi-chi, stand in front of the infra-red heater and pretend that I'm there! 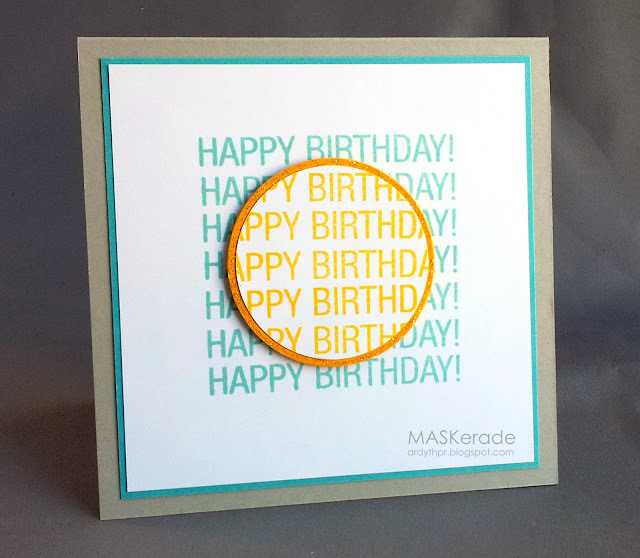 Love this - the colors & perfectly lined up sentiments make for a very happy card!